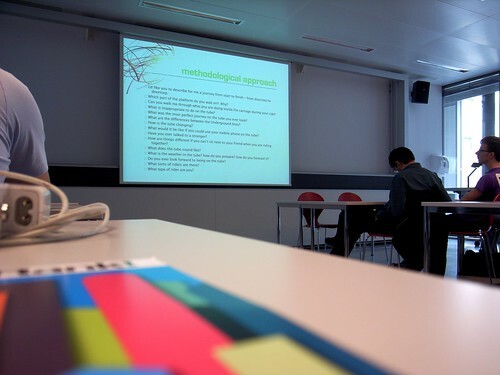 Back to EPFL today for a lecture by Johanna Brewer about "What can ethnography do for technology?". She basically presented how ethnography, as a methodological strategy, is relevant for design in the context of her PhD projects. Johanna did her PhD with Paul Dourish at UCI Irvine and she recently launched a new start-up called frestyl (in the mobile/web music business). After a brief introduction of *what is ethnography*, she showed how Human-Computer Interaction, initially based in Computer Science, evolved to include cognitive psycho concepts with a quantitative understanding of how humans interact with technology. Researchers recognized that this approach, though fruitful for certain purposes, could be complemented by others, such as ethnography. Which is *Ethnography met HCI*: as technology has become ubiquitous, multi-purpose, embedded, social, there was trend to move beyond lab-based studies of individuals and instead understand social use of technology. The point was then to leverage ethnographic techniques to seek inspiration for new designs. This quick summary was interesting but I think it partly ignores the use of ethnographically-inspired method in the broader context of design (that happened in parallel). In human-computer interaction, the way ethnography is employed is different than its earlier roots in anthropology: field study is shorter (week-long rather than year-long but the rationale is that one day is better than no days at all! ), there is a deep/narrow focus on particular setting (what's like to ride the public transport in lausanne? ), study of target users, with an eye towards technology design, not just understanding culture for the sake of it. Which led her to delineate two scopes: "open-ended, exploratory, revolutionary" versus "target, tailored, techno-centric" (look at a particular setting, or at particular features to be changed). After a brief description of the analysis part (documentation is analyzed through coding: looking for common themes in data), she presented the existence of various outcomes: a plan for follow-up ethnographic study (as it allowed to ask more questions), general guidelines for futures technologies, concept design, implementation of prototype, fully realized product. And all of this can take a large range of format: written document, video, photographic essay, design response/prototype to demonstrate ethnographic work. She then showed various examples taken from her work. I enjoyed the part about how she chose the sample group for her interviews. She used what she called "theoretical sampling": chose a theoretically interesting sample of people (rather than statistically representative) who are interested by the experience of the context she was exploring (the tube). I was also intrigued by how she looked for inspiration for design, not guidelines, something that I was not surprised of given that this was the reason why I invited her PhD advisor to Lift last year. Her point was that ethnography can give an impetus that what you design is culturally relevant as it roots your design in cultural underpinnings "when you go to a place and talk to people, you design sth that is relevant for them (and it also makes them appreciate what you do)". Why do I blog this an interesting overview that is certainly useful as I am preparing a course about these issues for next year's class at the design school in Geneva.